The last few years have brought many changes to central Florida theme parks in general and Walt Disney World in particular. Intense competition and major park additions over at Universal, Disney's main competitor, have compelled Disney to initiate a whole slew of construction projects which will debut over the next several years. One of the more recent additions to Walt's World was the introduction of New Fantasyland, which brought us an expansion of the classic Dumbo attraction, a new interactive water play area named Casey Jr.'s Soak Station, the truly unique Be Our Guest Restaurant experience, and the Seven Dwarfs Mine Train family thrill ride, to name a few. New Fantasyland also brought with it a new Magic Kingdom daytime parade entitled Festival of Fantasy. Disney is world renown for setting the standard when it comes to parades. True, there is nothing like the Macy's Thanksgiving Day parade and there are those who would swear that nothing can hold a candle to the Tournament of Roses Parade, but these are painstakingly planned and prepared for across 364 crescendo-building days and then they explode into a few hours of organized chaos. What sets Disney apart in comparison to these parades of pageantry and tradition? Disney puts on a parade every day. In fact, they put on several of them a day, sometimes putting on the same one twice in one day. Considering all of this, it is hard to imagine that Disney could still surprise their die-hard fans. Well, whether you are a die-hard or a newcomer, if you haven't seen the Festival of Fantasy parade, prepare to be surprised. This parade combines all the traditional elements of a classic Disney Parks parade, but infuses a few new twists that bring the experience to a whole new level. As with all Disney parades, there are plenty of characters, drawn from many of your favorite Disney films such as Peter Pan, Beauty and the Beast, Tangled, The Little Mermaid, Brave, Pinocchio, and of course, the instant classic, Frozen. New and imaginative floats, each unique and distinct from one another are featured in this parade. While the previous Magic Kingdom day parade leaned toward uniformity with a multitude of floats spotlighting characters enclosed in snow globes, the Festival of Fantasy parade rolls out a cavalcade of floats all painstakingly designed and themed to the film that they represent. 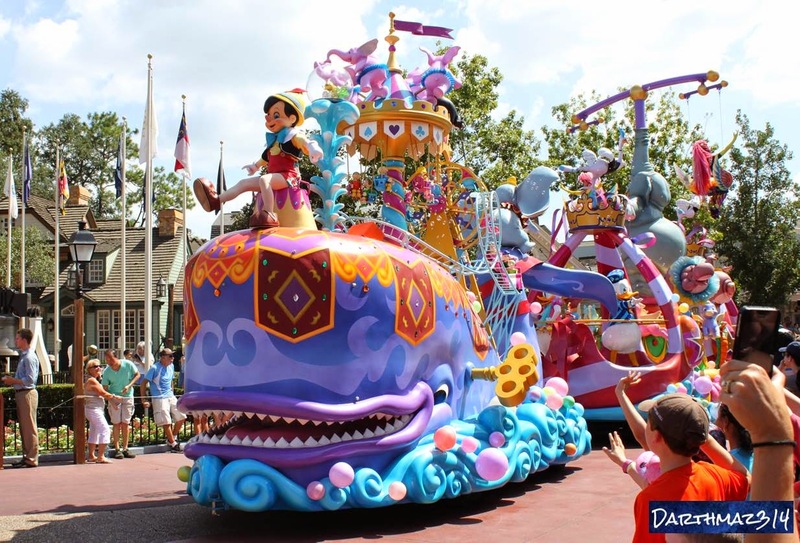 Case in point is the Pinocchio float, which consists of an enormous whimsical recreation of Monstro the whale, which the famous wooden boy rides "on" in this parade, instead of "in" as he does in the classic film. If there is a criticism of this parade, it would be that as with much of Fantasyland, it is heavily themed toward princesses and therefore, the female audience. But if you can keep the boys and men from fleeing the parade route when the testosterone begins to rage, they are in for a treat...a very large, ominous, fire breathing treat. Toward the end of the parade, the true star of the parade makes her appearance. 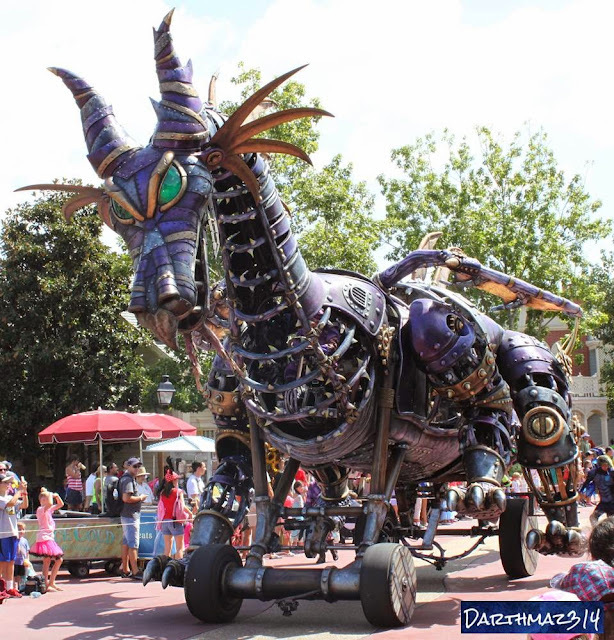 A mechanical (some say "steampunk" decribes it best) version of the Maleficent dragon comes gliding down the parade route in all its powerful and menacing glory. As if its mere presence wasn't enough, it rears is ferocious head and breathes a blast of fire high above the crowd to let everyone know whose parade this truly is. This alone is worth offering up fifteen minutes of your Disney World day. So be sure not to miss the Festival of Fantasy Parade at Magic Kingdom if you will be at Walt Disney World in the near future. If not, please enjoy the full parade in HD video right here at darthmaz314.com or on our YouTube channel Joe Darthmaz. Also be sure to check out our Festival of Fantasy photo post for HD stills from every portion of the parade coming soon. May the Fourth Be With You from darthmaz314.com!